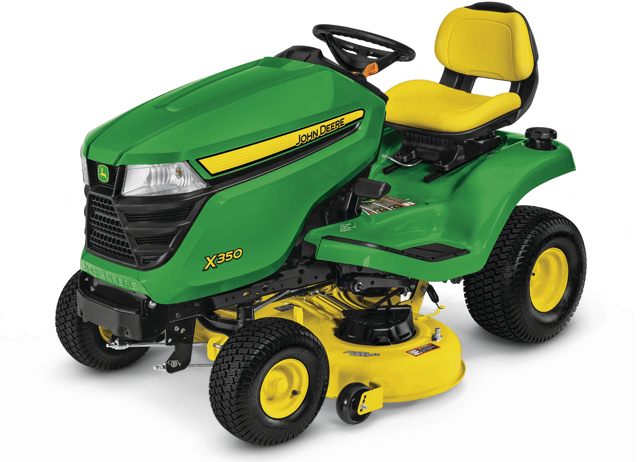 The X350 is equipped with the new ACCEL DEEP™ mower deck, a deck that has a single-piece stamped steel shell specially shaped to maximize airflow for optimal cut quality, especially at faster speeds. What makes the ACCEL DEEP mower deck unique is its nearly 5-inch-deep shell that extends all the way around, and its smooth shape. The deep shell maximizes airflow to lift grass up for the most level cut possible. The X350 also features a modern control console. The console features a tachometer with a best cut target zone to help you identify the top speed for a premium cut in your yard. The console is back lit for night visibility or snow blower use and has a luxury automobile feel. Other features include an electronic fuel gauge to let you know when to fill up.